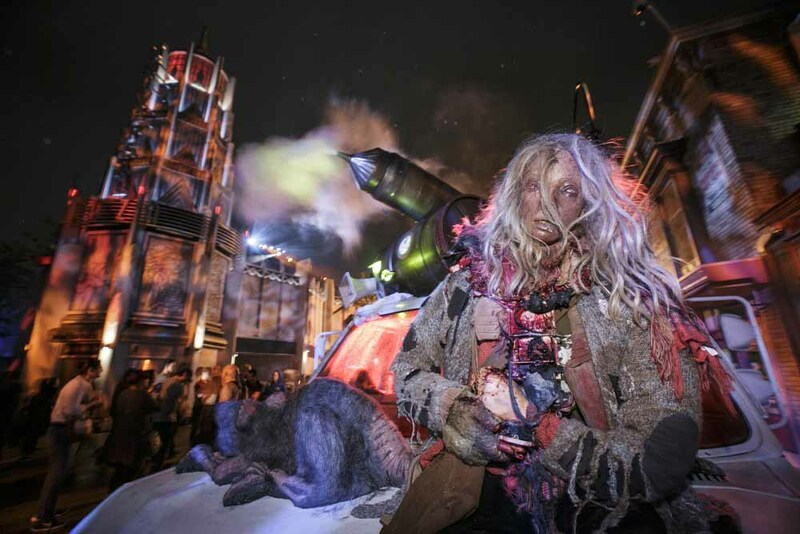 If you are fleet of foot and clear of purpose, it is possible to get to all the attractions at Halloween Horror Nights - even without front-of-the-line privileges. Believe it or not, Hollywood Gothique is not invited to every Halloween event in Los Angeles. Occasionally we miss out, but that's okay - invitations are a privilege to which one should not feel entitled. Also, paying our own way provides a perspective missing when given not only free admission but also front-of-the-line access; without these perks our experience becomes more analogous to that of our readers. 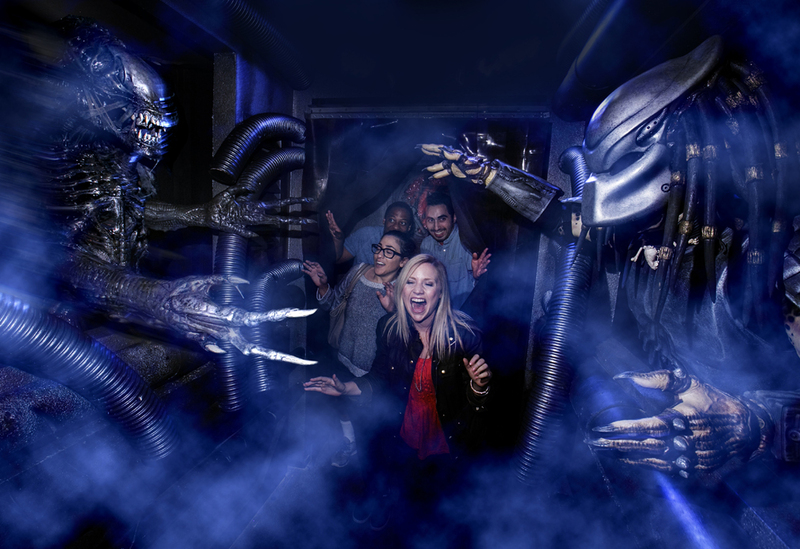 One such example is our trip on Friday to the opening of Halloween Horror Nights at Universal Studios Hollywood. We purchased our own general admission ticket but opted against the exorbitantly priced $179 Front of the Line tickets. Thus, we found ourselves having once again to rely strategy in order to get through all of the theme park's Halloween attractions without running out of time because of 90-minute lines. 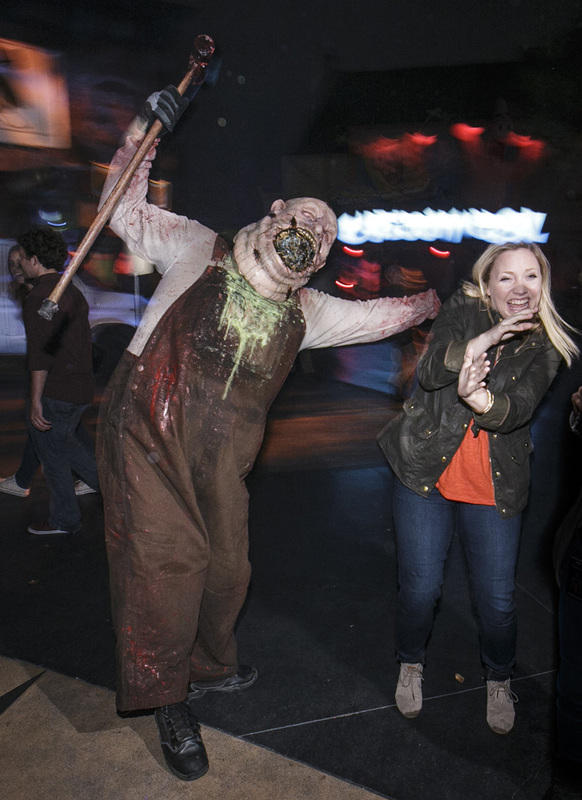 Based on that experience, we offer these suggestions for navigating Halloween Horror Nights without fast pass privileges. Do not let the monsters distract you on your way to the lower lot. Although Halloween Horror Nights officially beings at 7pm every night, your general admission ticket allows entrance from 5pm to 6:15pm at no extra charge. The haunted houses and mazes are not open that early, but getting inside the park will enable you to secure a place near the front of the line at whatever attraction you choose first. 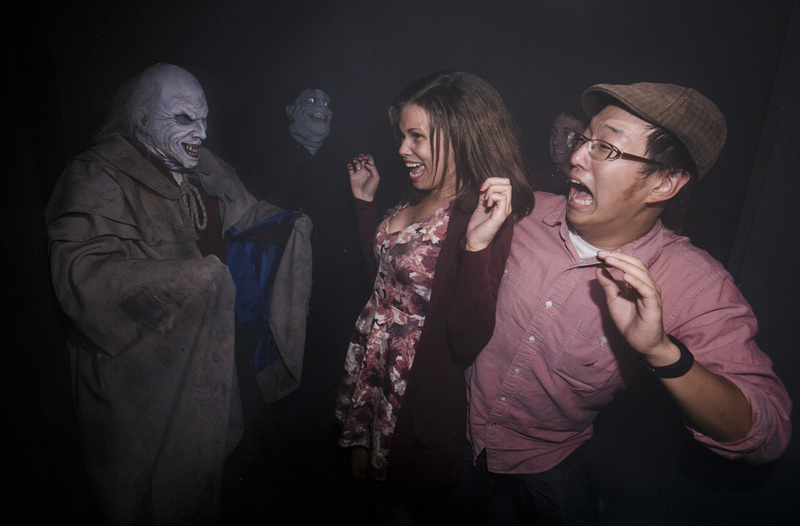 Like last year, Halloween Horror Nights 2015 has situated the majority of its haunted events in the lower lot. Once you get inside Universal Studios Hollywood, race to the escalator near The Simpsons ride and hurry down to Insidious: Into the Further, The Walking Dead: Wolves Not Far, This Is The End, Crimson Peak, and Alien Vs. Predator. Brief note: the maps handed out by Universal are helpful but not absolutely necessary if you are familiar with the theme park layout. With so much packed into one relatively confined area, it's not as if you need to chart an elaborate course through the entire theme park. Most visitors to the theme park do not have a clear plan; they will probably be distracted by the upper level scare zones, Exterminatorz, Dark Christmas, and Corpz. 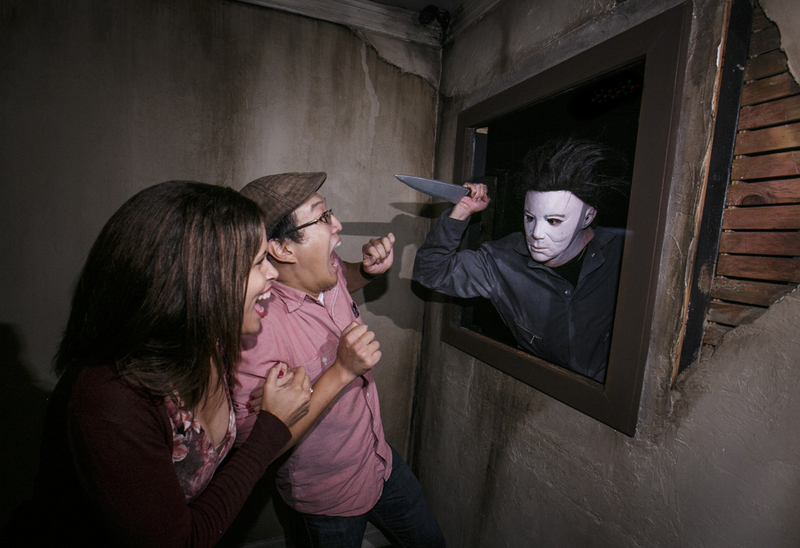 While the lemmings are wasting time on these or lining up for Halloween: Michael Myers Comes Home - the only maze on the upper lot - you will be ahead of the crowds, getting a jump on the action. When you hit the lower lot, you will face a dilemma: go straight to the Insidious maze, which is to the left of the escalator, or turn right, toward the Transformers 3D ride, and seek out the other four mazes on the lower lot. It's a tough choice, but on Friday night, The Walking Dead: Wolves Not Far opened at 6:30pm - a half-hour before anything else. This allowed us to finish our first maze and get out in time to reach other mazes that were just opening. 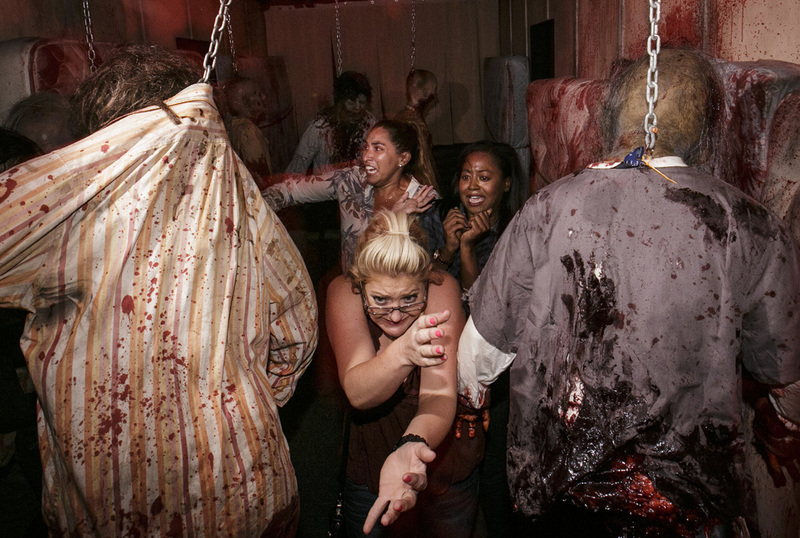 Even if the early opening is not repeated on subsequent nights, The Walking Dead maze is popular and will become very crowded later in the evening. If you're in line by 6pm or so, your wait will be thirty minutes instead of ninety. The Walking Dead: Wolves Not Far is just to the left of the Transformers 3D ride - a little bit out-of-the-way and possible to overlook if you are not deliberately seeking it. That won't last for long, but before the sun sets, you stand a good chance of getting a good spot in line. After exiting The Walking Dead, retrace your steps to Transformers; just beyond it (to the right as you face the ride's entrance) you will see This Is The End. On Friday night, the general admission line was a mere ten-minute wait shortly after 7pm. Unfortunately, the exit will dump you out back near the escalator, so you will have to walk around toward the Transformers ride again to get to your next destination. These two mazes are a bit farther away on the back lot. A sign near the entrance to This Is The End points you in the right direction. A moderate walk takes you to the boarding station for a short tram ride, which deposits you at the entrance to the The Purge: Urban Anarchy, a great scare zone based on the film franchise about an annual night when all crime is legal, including murder. Because this area is so far off the beaten track, it will take a while before the lines grow too long for Crimson Peak and Alien Vs. Predator. Even without a fast pass, you can conceivably get through one or two of these mazes by 10pm. If you're not so lucky and the crowds are worse than imagined, you can possibly skip Alien Vs. Predator, which is essentially the same as the version seen during Halloween Horror Nights 2014. By the time you have completed this portion of the itinerary, you are halfway done, and you should still have four hours to finish up the remaining mazes and the terror tram. Go Further into the Further, or Survive the Purge? By now, the early advantage will have faded away, leaving you to suffer long waits, no matter what you do. At least you should get some satisfaction from seeing people spending 70 minutes to get into mazes that took you a mere 10. Circumventing crowds is no longer an option, so your strategy must shift to prioritization and time management. What do you want to see, and how long will it take to see it? Start with this decision: stay in the lower lot so that you can "Return to the Further," or head back up to the main lot. On Friday night, the wait for the Insidious maze had reached 80 minutes by 9pm. Is the maze worth your patience? It is a revised version of Universal's previous Insidious maze, but there are some notable changes. If you liked what you saw before and want to experience the new version, go for it; if you did not like the old Insidious maze, the revisions will not change your mind, so skip it and head up the escalator. Your two remaining choices after leaving the lower lot are Halloween: Michael Myers Comes Home and The Terror Tram: Survive the Purge. The later makes its last departure 11:45pm, so you should prioritize this; it's also closer to the escalator up from the lower lot, so heading there first will save you from having to backtrack later. Go past The Simpsons ride and head to the bridge that takes you down to the tram tour. You will probably get caught in a line, but the wait will likely grow longer if you wait until later. After the Terror Tram: Survive the Purge, return to the upper lot and make your way toward the front exit from Universal Studios. Along the way you will pass the new Michael Myers maze. A long line is guaranteed, but keep in mind that this maze is very similar to the 2009 maze, Halloween: The Life and Crimes of Michael Myers; like Insidious: Return to the Further, this is not an exact duplicate of what came before, but it's close enough so that you will know whether or not the wait is worth your time. Also, by this point you will have completed all the other Halloween mazes and rides, so it's not as if the wait will force you to miss anything. Now is the time for us to make a little confession: we did not wait in every general admission line, just the first few, so that we could give an accurate assessment of whether our strategy was working. It was, and we feel confidant that it will work for you - depending on which mazes are must-see attractions for you (if you really love Insidious, you might want to walk through that one first, before the crowds descend upon it). However, once we had reached the midpoint in the evening, when no amount of strategy would make the lines any shorter, we decided to opt for front-of-the line access. How did we manage this, without purchasing the more expensive ticket? Well, it turns out that, even though we were not invited to the theme park this year, our press badge from Halloween Horror Nights 2014 still worked, so we just flashed our badge and zipped past the crowds. In your face, Universal! Obviously, not everyone has this advantage. However, we were able to visit every attraction, take time out for a leisurely meal, revisit Crimson Peak, and still finish by 11pm - leaving three hours to spare. Even with 90-minute wait times, that's enough to stand in line twice more before the park closes. Of course, crowds will get heavier as the season progresses, but if you attend on an off-night, you should be able to see everything you want to see, without spending the extra $100 for a front-of-the-line pass. Find more seasonal theme park attractions on our Halloween Haunts page.